Yes, we have e-books! Visit https://www.altoonalibrary.org/cloudlibrary/ to access our e-book collection. You will need a current library card. The cloudLibrary app is available for Apple devices, Android devices, Windows, Mac OS, Kindle Fire, and most Nook devices. You can view simple how-to videos on the cloudLibrary website by clicking here. cloudLibrary is not compatible with Kindle Paper White, but will work with other Kindle devices. Learn how to download the cloudLibrary app for Kindle Fire at https://www.yourcloudlibrary.com/kindle-fire-installation/. Genealogy enthusiasts will love our Ancestry.com for Libraries database! Please Note that this database is only available within the library building, and you will not be able to access it from home. 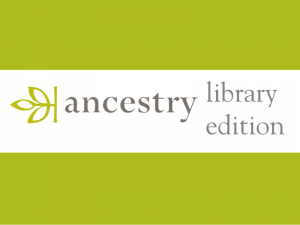 Visit the library anytime Monday-Thursday from 1-8 PM and Saturdays from 9 AM-4 PM to use Ancestry Library Edition. Power Library is Pennsylvania’s Electronic Library full of free, information-packed databases available to anyone with a library card. Visit Power Library by clicking here. Power Kids is a kid-friendly version of Power Library ideal for students. Visit it by clicking here. Please note that newer materials may not be available from other libraries in the Blair County Library System. If you need help placing holds on materials from other libraries, a librarian is always happy to help you. Ask at the checkout desk, or call us at 742-8234. If you need something and none of the libraries in Blair County own it, we can request materials for you via Access PA, the statewide interlibrary loan system. To request a book from Access PA, talk to a librarian.